Happy 7th Birthday to our sweet Angel Lauren! Warning – This is a longish post I wrote at 4:30am on Lauren’s birthday. 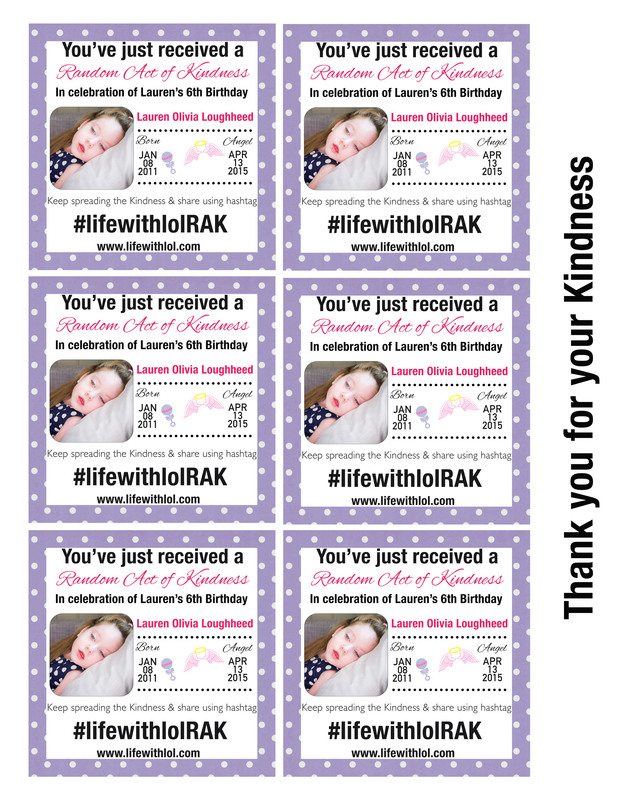 If you found us through Lauren’s Random Act of Kindness campaign and want to skip to those details you can check out the link below. January 8th 2011 – Lauren Olivia Loughheed would be born, my beautiful, perfect daughter. The contractions had begun on January 7th around 3pm. My mother had been visiting with me at home. With every first contraction I felt a mix of wonder and fear. So excited to meet our daughter and the fear of the unknown of what having her (i.e. childbirth) would be like. By 2am on January 8th (after our second attempted trip there) we were in the hospital waiting on her to make her entrance into this world. As I settled in, for what would be another 9 hours of waiting, the day was going to become even more special. My best friend since childhood had arrived at the hospital to welcome her own princess into the world as well! My imagination, already conjuring up a beautiful life for both our girls – destined to follow in the mothers tracks and to live as the best of friends. What I didn’t know then was that those dreams, and the life I had imagined for our daughter was one that was never to be. My bliss, excitement and joy would be shattered just 10 months after this day when she would be diagnosed with a terminal disease – Krabbe Leukodystrophy. I hate Krabbe Leukodystrophy. I sit here, the words I want to share muddled. I have too many thoughts, too much to share. I want to tell you about the incredible joy and happiness Lauren brought into my life – the beauty and inspiration. With every breath she took, I saw the world more closely. In winter I didn’t just see our cold and bleak surroundings – I saw the sun shining on the snow, the stunning glow of it. Snowflakes and frost were indescribably beautiful, the silence of winter so peaceful. She brought a warmth to the coldest days. In the summer, the world was so alive – the magnificence of the colours around us were appreciated in a way that as an adult I had forgotten. Lauren made me look and remember how beautiful our world was, I wanted her to experience it all! Life with Lauren wasn’t perfect (although she certainly was! ), I experienced and continue to experience many dark days. The memory of her illness and the pain she experienced at times still haunt me. With her removed from this world, my drive to focus on all the good and beauty has become much more difficult. Without Lauren in my arms, I am able to see the big picture of what her disease had done, how incredibly horrible it had been. Living in the moment vs then having a chance to review a collection of moments is so very different. If you don’t know our story, I invite you to look back through our blog articles. Then read about our family and our journey with this terrible disease. As a short summary I can tell you, our daughter was born appearing HEALTHY, she hit milestones, some early even! We were gifted smiles, her sitting, her first waves, and even a couple of words. She was as perfect as can be. In her 8th to 9th month, small changes began, unnoticed or brushed off at first. For each change we would have an excuse. Irritability – teething of course! Her stiffening legs – maybe she wanted to stand! We were new parents, we didn’t know things weren’t right. Then again the parents around us didn’t either, not until the disease really began to show. Our daughter began regressing much more rapidly in the month of October 2011. Thinking back now with my stomach in knots, I know that I knew at the time that something was off, but I could not have ever imagined what was to come. How could I know, a fate worse than any of my nightmares was waiting. Lauren lived to be 4 years old and 3 months. That was well after the prognosis we had originally received. In that time we vowed to give her a full and magical life. We travelled, we had her experience swimming and music and as much fun as we could find. Through Lauren’s life we were afforded many beautiful acts of kindness from others. Sometimes we would receive acts of kindness from friends, people we had known from our own childhoods but had lost touch with or even strangers who had heard about Lauren. It was another gift that Lauren had given us. A reminder of what good still existed in the world. I truly believe that we made it through her life because of our awareness of good. Without the kindness and good around us – I’m not sure if we would have been able to come up out of the darkness that had been consuming us since the moment we knew that her life was going to be unimaginably hard. Today Lauren would be 7 years old! Our big girl. We miss her terribly. If you would like to participate, the campaign will run until the end of this month. Its easy – you do good and then share it. There is no act too small to note, and it doesn’t have to fit in any specific box or description – Just be kind! 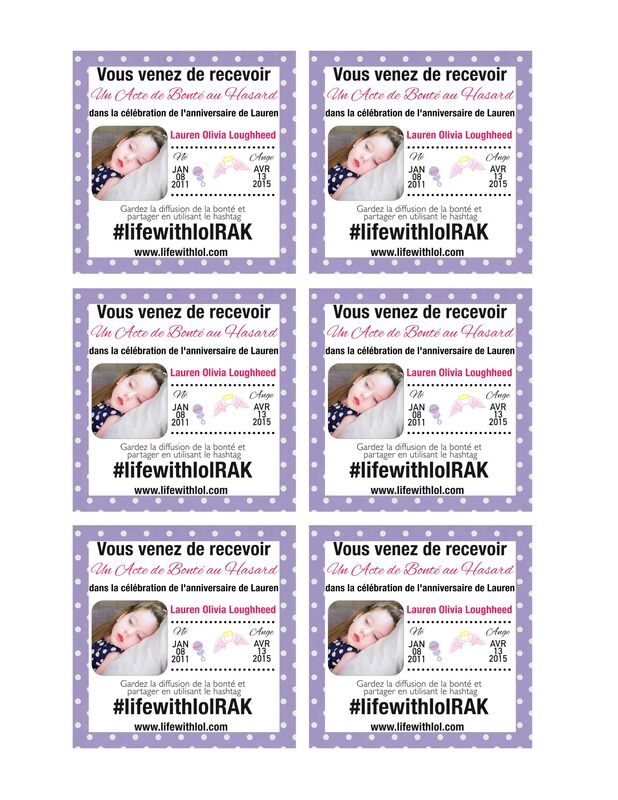 To help spread the campaign, use the hashtag #lifewithlolRAK and post a picture or description of an act of kindness (Random or not) that you completed in Lauren’s memory. This will not only help us to honour her legacy but to spread awareness of her disease. Spreading awareness not only helps bring a spotlight on Krabbe Leukodystrophy and its need to be included in newborn screening and research but also aids newly diagnosed families, to find us and to find a supportive community. There’s a post with printables that you can include with your act here. Please check out the link if you like. Also feel free to comment here with any fun acts of kindness that you took on this month in our Lauren’s memory. Thank you so much for sharing in this journey with us, and for wanting to do good. This year held many new milestones- some fun amazing one’s with Lauren’s little sister and others that were very hard and difficult, missing our Lauren and my big brother. 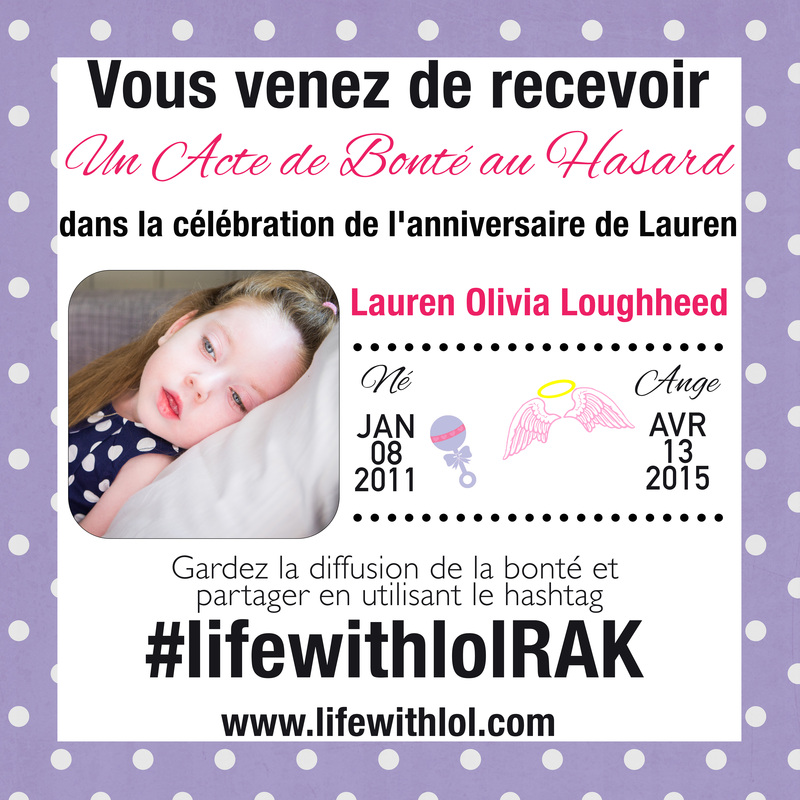 On January 8th Lauren will be celebrating her 6th birthday among her angel friends. Here on earth we wanted to do something very special to celebrate her memory. We are proud to announce we are once again hosting a Random Act of Kindness Campaign for the entire month of January. We would love for you to participate in this campaign that is sure to bring a little fun and warmth to the cold month of January. A Random Act of Kindness is a selfless act performed by a person that can bring help, kindness or cheer to another individual. You don’t have to spend any money to perform an act of kindness, and what you do is up to you! 3 – Remember to include the tag or image, consider leaving extra’s behind for the next person to use to help keep the movement spreading. 5 – Share the campaign on your social media! We will share some of our favourites at the end of the month! Click below to save the printable tags. Please share this post on all of your social media to help make this campaign soar! Thank you for helping us celebrate Lauren’s Birthday! Je ne peux pas croire que Janvier est déjà là, que nous dit au revoir à 2016 et saluent notre deuxième année sans notre Lauren. Les jalons de nouvelles vacances et les expériences sans Lauren ont été difficiles mais nous y faire face du mieux que nous pouvons et essayer d’honorer sa mémoire au maximum le long du chemin. Le 8 Janvier Lauren fêtera son 6ème anniversaire parmi ses amis d’ange. Ici sur terre, nous voulions faire quelque chose de très spécial pour célébrer sa mémoire. Je voudrais annoncer fièrement que nous organisons un campagne de Acte de Bonté au Hasard encore un fois, pendant tout le mois de Janvier. Nous aimerions vous inviter à participer à cette campagne amusante qui est sûr d’apporter de chaleur a ce mois froide de Janvier. Une Acte de Bonté au Hasard est un acte altruiste accompli par une personne qui peut apporter de l’aide, la bonté ou de la joie à un autre individu. Vous n’êtes pas obligé de dépenser de l’argent pour effectuer un acte de bonté, et ce que vous faites est à vous! 3 – Pensez à inclure la balise ou de l’image, envisager de laisser derrière de supplément pour la prochaine personne à utiliser pour aider à garder le mouvement se propager. 5 – Partagez la campagne sur vos médias sociaux! Nous allons partager certains de nos favoris à la fin du mois! Cliquez ci-dessous pour enregistrer le PDF de balises imprimables. S’il vous plaît partager ce post sur l’ensemble de vos médias sociaux pour aider à faire de cette campagne monter! Merci de nous aider à célébrer l’anniversaire de Lauren! I can’t believe that January is already here, that we said goodbye to 2015 and are greeting our first year without our Lauren. The milestones of new holidays and experiences without Lauren have been tough but we face them the best that we can and try to honour her memory to the fullest along the way. 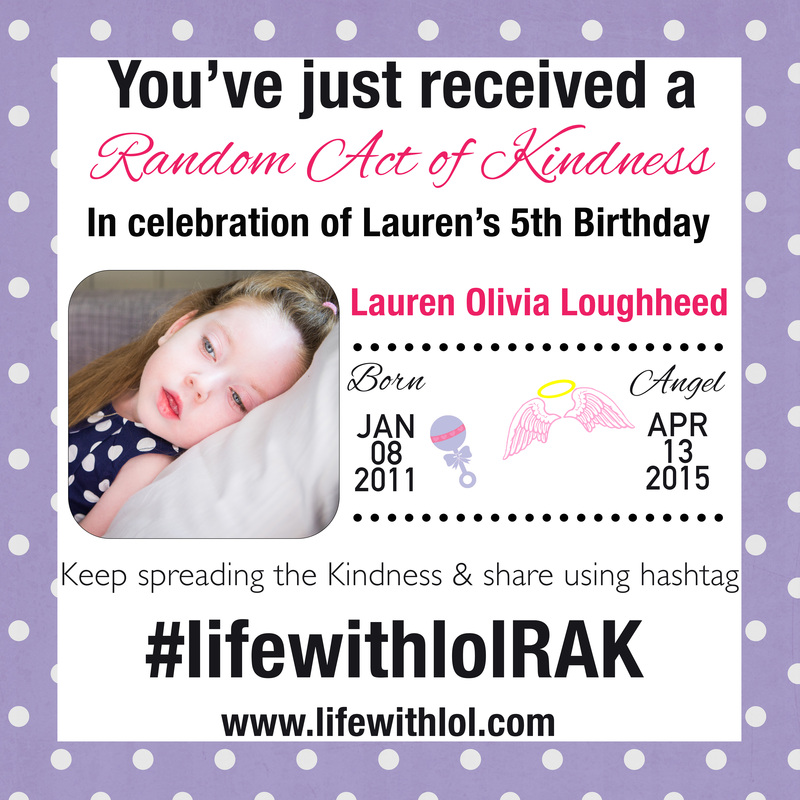 On January 8th Lauren will be celebrating her 5th birthday among her angel friends. Here on earth we wanted to do something very special to celebrate her memory. I would like to proudly announce that we are hosting a Random Act of Kindness Campaign for the entire month of January. We would love for you to participate in this fun campaign that is sure to bring a little fun and warmth to the cold month of January. Click below to save the PDF of printable tags. Je ne peux pas croire que Janvier est déjà là, que nous dit au revoir à 2015 et saluent notre première année sans notre Lauren. Le 8 Janvier Lauren fêtera son 5ème anniversaire parmi ses amis d’ange. Ici sur terre, nous voulions faire quelque chose de très spécial pour célébrer sa mémoire. Je voudrais annoncer fièrement que nous organisons un campagne de Acte de Bonté au Hasard pendant tout le mois de Janvier. Nous aimerions vous inviter à participer à cette campagne amusante qui est sûr d’apporter de chaleur a ce mois froide de Janvier.